Givenchy has launched L'Atelier de Givenchy, a new collection of seven unisex fragrances: Ambre Tigré, Bois Martial, Cuir Blanc, Chypre Caresse, Néroli Originel, Oud Flamboyant and Ylang Austral. Ambre Tigré (shown) ~ "Suggestive of lush nature and animal impulses, Ambre Tigré is a feline fantasy, a call for passion. Amber evokes the bewitching, magnetic sensuality of Givenchy Couture skin and fur prints, while the fullness of vanilla and the animality of labdanum ciste soften the amber’s fervour, completely melting into it, as a leopard’s spots blend into its coat. Ambre Tigré awakens our most sensual instincts, preparing us for enchantment of all kinds." Bois Martial ~ "Bois Martial echoes Givenchy Couture’s ultra-structured, architectured cuts, which are frequently softened with a free and vaporous touch. This contrasting, sometimes androgynous style lends majesty and authority to the silhouette. Dictated by the same intentional geometry, the fragrance’s olfactory identity adopts a special dimension by building on a wood seldom used in perfumery: coconut wood. This wood chooses pineapple sage as its wild and vivacious emissary. The unexpectedly creamy facets of pineapple and coconut defy the calculated austerity of the whole fragrance by composing an eccentric harmony. This whimsical, gourmand accord is illuminated by the dry, intense radiance of cedar wood. The wood becomes legend and turns Couture in an intense olfactory minimalism." Cuir Blanc ~ "The audacious blend of Cuir Blanc is controlled and complex. Leather, the ultimate noble material, evokes the perfumer’s original profession of glove maker. An ancestral alliance of French luxury... Carnal yet luminous, white pepper, white musk and white leather compose a quasi-tactile olfactory approach to translate the sensorial pleasure of leather on the skin. It defies the notion of colour, creating a triumphant balance. Sculptural and absolute, the personality of Cuir Blanc transcends the conventional standards of fashion and perfumery." Chypre Caresse ~ "Chypre Caresse is the olfactory translation of a timeless and delicate Haute Couture dress featuring diaphanous pleats, fine embroidery and evanescent feathers. Subtly, like mist rising over morning dew, this sparkling, crystalline chypre exalts freshness before gradually revealing its timeless woody chic. It gives natural charisma and aerial nobility and grace to the individual who wears it. Crystalline lemon flesh blended with jasmine dew brings a luminous fluidity to the accord. The vegetal green accent of angelica evokes a parasol of petals as soft as dotted swiss, with a refined, suave and musky scent. Then comes patchouli, which gives the base note a precise architecture." Néroli Originel ~ "Néroli Originel was inspired by the model of a dress worn by Givenchy's first muse, Audrey Hepburn. The alchemy of her encounter with Hubert de Givenchy gave rise to a new style blending grace with elegance. For the innately chic person, neroli is the must-have scent. Radiant and delicate, neroli blossoms here like a powdery kiss under the caress of iris which, like a murmur of taffetas, tones down neroli’s luminosity with its subdued tonality. Musk-seamed vanilla wraps its rich smoothness around the composition’s vaporous contours in a generous ball effect. A majestic floral, Néroli Originel reveals a radiant personality and inducts neroli into the pantheon of iconic elegance." Oud Flamboyant ~ "Oud Flamboyant brilliantly translates Givenchy’s creative force and excellence. Just like Haute Couture summons the art of the splendorous and the spectacular, this olfactory creation summons the sacred spirit of the Orient to immortalise the magic of bodies adorned with precious embroideries and golden-brown fabrics. Oud wood gives the fragrance its utter magnificence. Bedecked with rare and precious facets, like the golden mosaics that dazzle on Givenchy silhouettes, it evokes an extroverted and luminous potency. Unsettling and enchanting, it sensually blends with the mystical fervour of labdanum ciste and the smoky aromas of leather. The fragrance of One Thousand and One Nights, Oud Flamboyant symbolises the eternal feminine in all its strength and mystery." Ylang Austral ~ "Givenchy Couture combines extreme structural precision with freely chosen materials, like Ylang Austral, which truly invites us on a journey. Exotic, chic and radical, it envelops the skin with an ultra-voluptuous, woody floral heat. The fragrance kicks off by unveiling notes at once classic and unexpected. The fruity-green touch of mandarin leaves foreshadows the opulence of a luxuriant adventure. Legendary ylang-ylang enchants this olfactory composition with its Creole charm and exotic, gourmand sweetness. An enveloping, woody base of sandalwood also escapes conventional codes to reveal lusciously smooth, sunny accents. Somewhere between flower and wood, Ylang Austral’s trail turns the senses upside down. A fragrance synonymous with a dream-like odyssey." 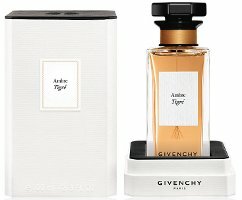 L'Atelier de Givenchy Ambre Tigré, Bois Martial, Cuir Blanc, Chypre Caresse, Néroli Originel, Oud Flamboyant and Ylang Austral are available now at Harrods in the UK, £140 each for 100 ml Eau de Parfum. Update: the collection will launch in the US in April at Saks Fifth Avenue. The perfumers were Alexis Dadier for Ambre Tigré, Françoise Caron for Bois Martial, Nathalie Lorson for Cuir Blanc, Sophie Labbé for Néroli Originel, Pierre Négrin for Oud Flamboyant and Emilie Coppermann for Ylang Austral. …and Givenchy joined the latest trend of creating a collection with fragrances similar to other already released collections, even the bottles resemble the Tom Ford’s. BTW, I just bought TF Tuscan Leather, incredible quality, sexiness in a bottle… it DOES smell like cocaine inside an expensive brand new car with a hint of creamy raspberry that lasts forever after the leather is gone (abour 4-6 hours later). Yeah, it took them long enough though. The bar has been set pretty high at this point, hope they’re good. The boxes look like Chanel’s Les Exclusifs… and 140 Euro OMG! Yeah, will be interested to see what they charge here, assuming they get here. They cost less than the Cartier Collection and a little bit less than the Hermessences. It seems more like the standard price to make them look more selective i guess. Well, i’m quite intrigued by this collection. It’s, as we would have expected, standard in terms of what it will offer (an amber, an oud, a floral fragrance, a citrus one), but the names seems funny (ambre tigré and bois martial are my fave). Maybe one or two will stand out and be really gorgeous? Oh, I wish they’d done Cannelle Exquis! Unisex? Really? They’re describing pineapple-coconut gourmands and ylang-heavy florals in such terms as “eternal feminine”, “diaphanous pleats”, and “parasol of petals” and then calling them unisex? I am obviously okay with anyone wearing any scent they like, and I know this is just the usual Prix Eau Faux perfumery bumf, but most of these do not sound very unisex at all. Harrods is listing 3 of them under women’s, 3 of them under men’s, all of them under unisex. So no idea how they’re supposed to work, gender-wise. ” … preparing us for enchantment of all kinds” I find that statement rather endearing. It would be nice if the Bois Martial smelled like Ananas Fizz (if they bring AF back again, I’ll buy a bottle). A feline fantasy? lol. Silly. I agree with some of the previous comments on the packaging: the box looks like the Chanel Exclusifs, the bottle is streamlined and square like MFK and the stopper looks like Tom Ford. Let’s hope that at least the juice is original. I’m drawn to Cuir Blanc, although I fear it might be too musky, and Ylang Austral. I’m still looking for a perfect Ylang perfume where Ylang is the dominant and not the extra note. Anyhow, it’s exciting to see a new line by Givenchy who used to make great perfumes in the past. I wonder if these will ever make it to Japan though.